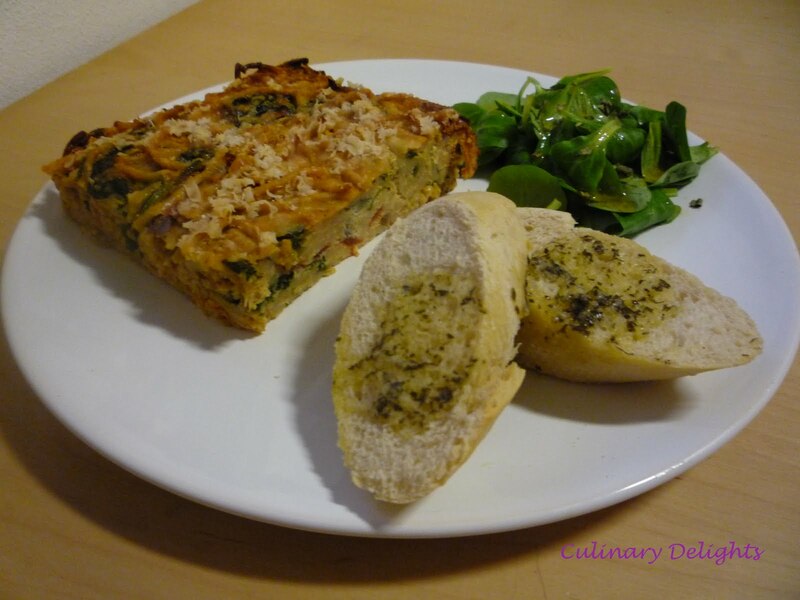 CEiMB – Spaghetti Frittata with Salad Presto – My pick!!! This weeks it’s my turn to pick the recipe for Craving Ellie in My Belly and I chose Spaghetti Frittata with Salad Presto. It seemed like the perfect recipe to use up leftover pasta and marinara sauce, for the marinara sauce I used the recipe from The Food You Crave (page 153, see below). Now, let me start by saying that I got to learn to read recipes better before picking them: in this recipe the eggs are partially cooked in a pan and then put under a broiler. I don’t have a broiler or an oven-safe pan!!!!!! So I decided to bake the frittata in my oven: : I prepared the veggies and spaghetti as written in the recipe, I then put the veggies and spaghetti in a 9×13″ ovendish, added the beaten eggs and topped it with grated Parmesan. I then baked it for 45 minutes in a preheated oven at 350 degrees. I really liked this when I ate it hot for dinner, paired with the Salad Presto and some store-bought Garlic Bread. But I also loved it the next day at work, when I had a cold piece for lunch served with some Mustard Soup. My mom really liked it too! Go here to check out what my fellow Ellie-istas thought of the Spaghetti Frittata with Salad Presto!! In a medium bowl, separate 5 of the egg whites, discarding the yolks. Add the remaining 5 whole eggs to the bowl with the whites and whisk to combine. Set aside. Preheat the broiler. Sprinkle the top of the frittata with cheese and place under the broiler. Cooke until the top is set and golden brown, 2 to 3 minutes. Be careful not to overcook or the eggs will become tough. Cut into 6 wedges and serve. Put the greens in a medium salad bowl. In a separate bowl, whisk together the oil and vinegar. Drizzle the dressing over the greens and sprinkle dried basil on top. Season with salt and pepper. Serve. In a large pot, heat the oil over medium heat. Add the onion and cook, stirring occasionally, until soft, about 5 minutes. Add thegarlic and cook for 2 minutes longer. Add the remaining ingredients and cook, uncovered, stirring occasionally, until thickened, about 30 minutes. Season with salt and pepper, to taste. 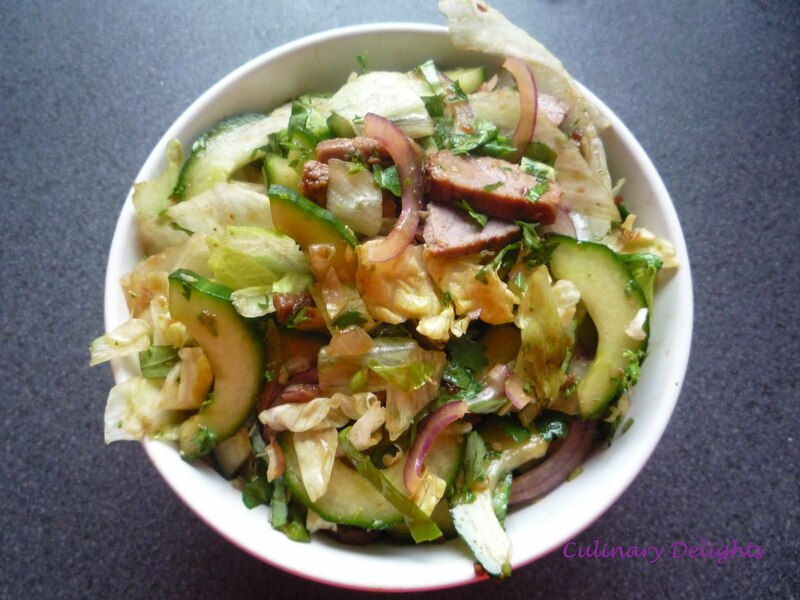 This weeks recipe for CEiMB was picked by Jen of Jen B’s Cooking Carveout, she picked the Grilled Thai Beef Salad. Made it, loved it! Forgot to photograph it…So picture and more info will follow later tonight when I come back from the gym! The recipe can be found at Jen’s blog and here at Foodnetwork. 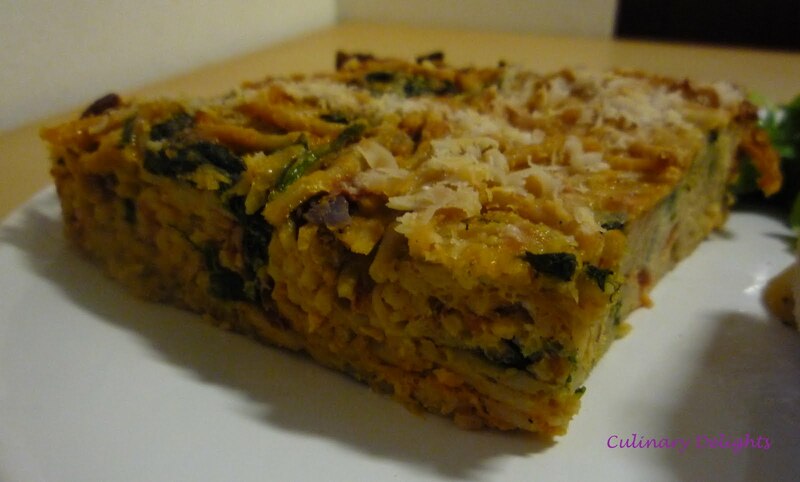 Check out what my fellow Elie-istas thought of this recipe here! My first three days in Canada passed by so fast, so here’s a short impression for y’all before we get to the good part: the recipes!! Kim and Lisa in the hot tub! Wednesday June 10th: Lisa had to finish some work so I went shopping and afterwards we met Andrea and her daughter Tea at a BBQ. Thursday 11th: today started with a visit to St. Jacobs Farmers Market, where I bought some mango and cherry fruitbread, blueberries (soooo much cheaper than home), apple fritters, a cute sterling silver ring and some maple syrup ofcourse. Marie from A Year at Oak Cottage advised us to visit Anna Mae’s Bakery & Restaurant in Millbank and we were happy to oblige: we had a lovely meal! I really enjoyed my Grilled Chicken Breast with a Cheesebun, Corn and French Fries. The fries were coated in something that looked like breadcrumbs and tasted delish: a simple, good and wholesome meal. We then took a Lemon Meringue Pie with us to have coffee at Deb’s place where we shared half of the pie. Back to St. Jacobs to do some more shopping, I ended up with some kitchen utensils, some chocolates (duh….) and fell in love with both an angel ring and a necklace with three hearts dangling on it, one heart says live, one says love and the third says laugh. Soooo cute. We had some salmon skewers laying around in the freezer, I wizzed up this lovely glaze from Canadian Living, we changed the recipe a bit ’cause we didn’t have a cedar plank laying around, and Lisa grilled the salmon, some veggies and threm together a lovely salad with dressing. Everthing was soooooo yummy!!! In a small bowl whisk together maple syrup, mustard, salt and pepper; brush half over salmon skewers. Place skewers on grill over medium-high heat; close lid and cook, brushing once with remaining maple mixture until salmon is done, about 10 minutes. Finely dice the garlic, put in small bowl together with the olive oil, balsamic vinegar and honey and whisk together. Pour over salad and enjoy! I had a real early start this morning: I was wide awake at 5 am. After some useless attempts to get more sleep I got up at 5.30 and was on my way to work at 6. Surprisingly I wasn’t even the first to arrive at work around 7 am: there were already 10 cars in the garage! Spring has finally arrived: today it was 23 degrees Celsius here in Holland, not the best day to be spent in the office…. So when I came home from a long day at work and the sun was still shining outside, the last thing I wanted to do was spent another hour in the kitchen. 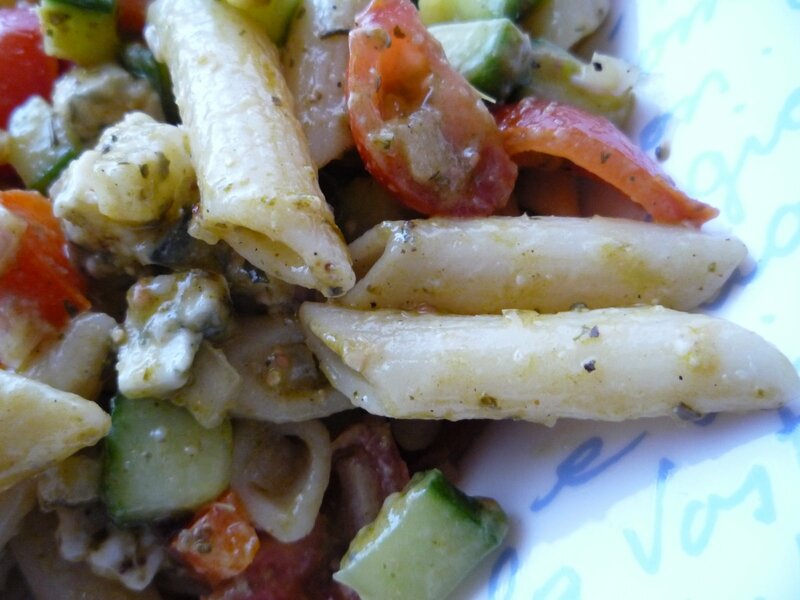 Here’s what I came up with: a lovely pasta salad with gorgonzola and pesto. Cook the pasta untill al dente. Cool the pasta a bit under running cold water. Put all the ingredients into a bowl, add salt an pepper to taste and mix well. Enjoy! This is one of my favourite songs at the moment. The song is called ‘Sweet Goodbyes’ and it’s by Krezip. This is actually the last song on the last album from Krezip, this album is on my wishlist. Krezip have been performing for the past 12 years and have unfortunately decided to quit. My friend Ingrid (a huge fan of Krezip) and I were lucky enough to be able to get some tickets for a concert last December, it was amazing. 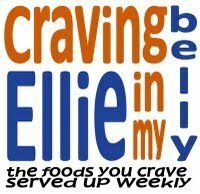 Time flies when you’re having fun: another Thursday had arrived and I’m happy it did, ’cause that means it’s time for Craving Ellie in My Belly!! 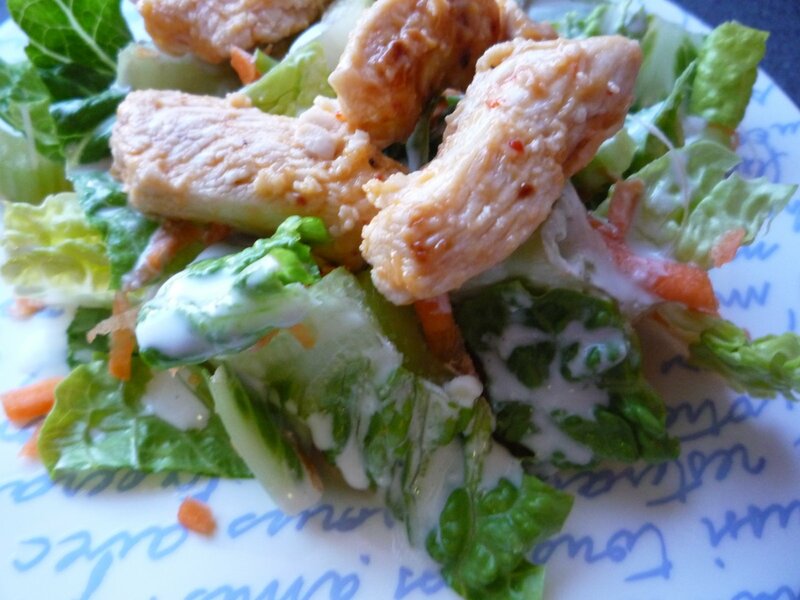 This week AJM from You Eat Now got to pick the recipe, she selected Buffalo Chicken Salad. The recipe can be found here. I must admit, when I saw the list of ingredients I had some doubts about this recipe. You see I love hot sauce and I love blue cheese, but simply couldn’t imagine that those two would taste good when combined in one recipe. Boy, did Elly prove me wrong!!! I decided to make this salad as a side dish with some great pasta with broccoli and cheesesauce (recipe will follow tomorrow) and served it yesterday when a friend came over for diner. We loved it! 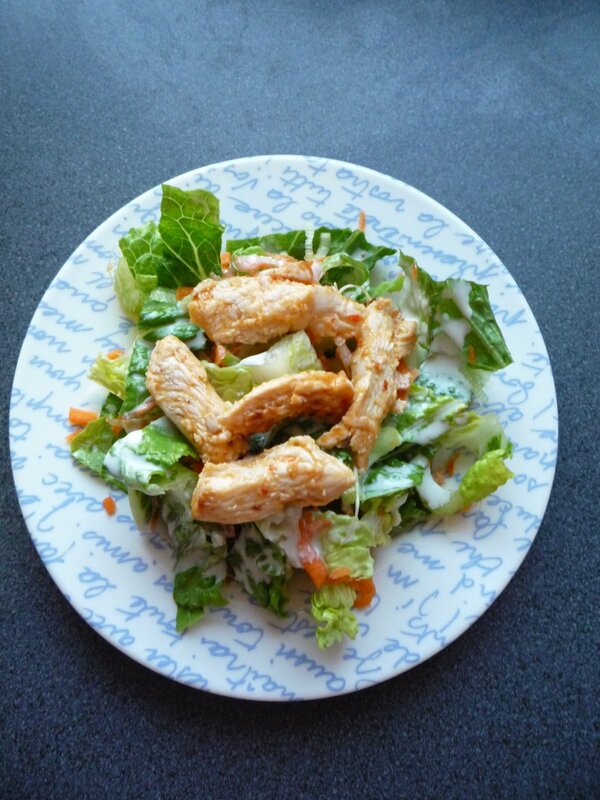 The dressing is perfect: the taste of the blue cheese (I used gorgonzola) is not too strong and the chicken is a great addition! Yum! Another recipe that I’ll be making again! Ow…. Only 3 WW Points per serving and about 1,5 for the side dish!! By the way, so far I lost 4 kilos in one month 🙂 And if you would like to join CEiMB, go check out this site!